This is a post that I did when I first started blogging 3 years ago! I have so many new readers and it is such valuable info, I wanted to update and re share! Ummm so don’t mind the fuzzy pictures! 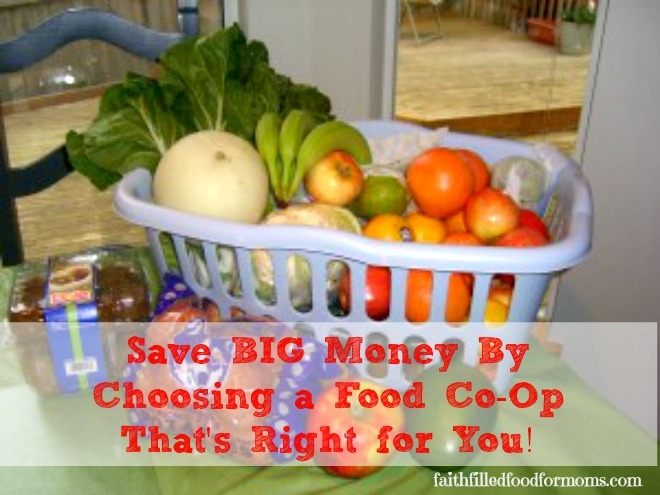 I have found a fantastic way to save BIG on groceries by joining a Food Co-op. One thing I love most about Summer is the wonderful assortment of fruits and vegetables that are available. Mmmm! I was looking for ways to save on our grocery bill (like everyone else) so I thought I would try it out. I have to admit I was a little apprehensive. I could envision working a few hours and getting a few carrots and maybe some lettuce or something. Much to my happy surprise I spend about a 1/2 hour every 4 times volunteering to help get the food distributed! The cost, $20 for all of this! What a huge blessing to our family. 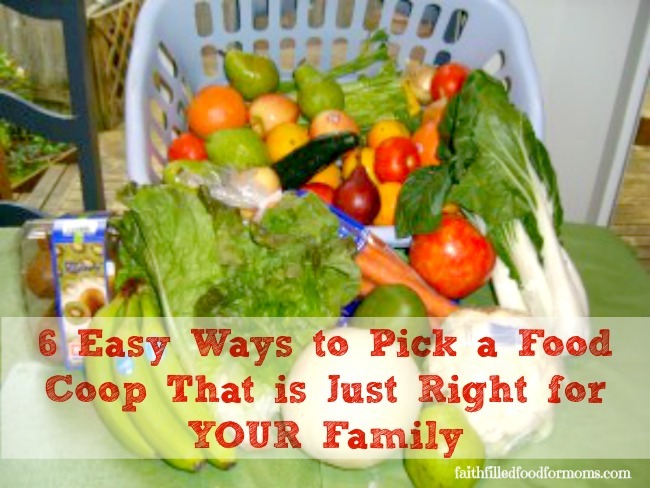 We get more of a variety of foods that I may not try if I were buying from a grocery store. It also eliminates the middle man (grocery store) so the food is very fresh. For $10 more I got an extra basketful of fruit. Doesn’t this make you mouth water. So I would like to encourage you, before the summer is over to check out some of your local Food Co-ops. To me the time, effort and $$ are worth it. Location – Some of the locations are not the most convenient. Take into consideration, distance, gas money and so on. Volunteers – For me it is important that the Co-op I belong to is family friendly and that I can take my kids anytime. The heart of the Co-op – We get opportunities to contribute to the local food banks. Also, if for some reason we cannot pick up our produce, it is then donated to local food banks or needy families in the area. Commitment – I do not have to commit to buying from my Co-op every time they have an offering. If I don’t need stuff, I don’t get it. Are you wondering what I do with any left over fruit or vegetables with so much? Freeze it and make smoothies of course. We are smoothie crazy! If you are not sure where to start to look for a good family friendly Food Co-op I would like to suggest BountifulBaskets.org They have Co-ops in many different states. I started there and then found a Co-op a little more convenient for me. Or maybe you could start a Food Co-op in your area! I am not an affiliate of Bountiful Baskets:) But they are awesome! All that fresh food looks wonderful, Shari! I wonder if there’s a food co-op by me? I’ll have to check out that website. Thanks for posting your link in my community today! It is fantastic and such a great price! It is definately worth trying out..hope there is something like that near you! I LOVE Bountiful Baskets!! We have a really close pick-up location and it is an awesome deal on fresh produce! That’s awesome Mona! Fantastic deal isn’t it..I just love my Co-Op 🙂 So glad you have a Bountiful Baskets near you! Blessings and thanks for stopping by!